School District 4 serves the area of Woodruff, SC. While it may have a population of slightly more than 5,000 residents, Woodruff is more than just a small town in Spartanburg County. Offering residents the opportunity to live a small-town life while still enjoying many of the amenities associated with big cities, Woodruff has numerous well-established neighborhoods offering stylish and affordable homes to families as well as retirees. Like many small towns across the United States, Woodruff's high school athletics have played a large part in building a great community. Because of this, Woodruff High School has found itself as one of the most successful football programs in the United States, with several state titles to its credit. Due to this success, the town is seen as a close-knit community where neighbors know one another and provide a safe and friendly environment for families. When it comes to employment opportunities, Woodruff residents have plenty of fields from which to choose. Education, retail, healthcare, and manufacturing are all strong employment fields in the area, offering plenty of well-paying jobs that encourage families to put down roots and call Woodruff home. 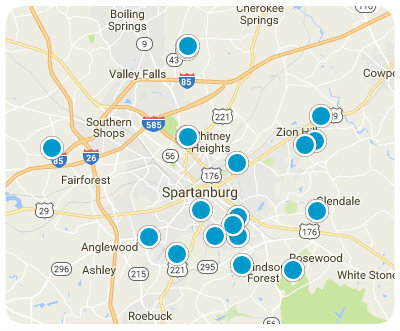 For those who want to make the trek to Spartanburg, they can also find job opportunities in high finance and municipal government. When it comes time to relax, Woodruff residents have plenty of opportunities. With its many parks and bike trails, residents can lead an active lifestyle while still staying close to home. And when it comes time to gather the family for an outing, residents can look forward to concert series such as 2nd Saturday Outdoor Music, which highlights a variety of musical genres including bluegrass, rock, country, and many others. Not only are these concerts a chance to spend time with family members, but also with friends and neighbors. Despite its small size, Woodruff residents have plenty of reasons to be proud of their hometown. Whether it's spending a Friday night watching the high school football team win yet another state title or attending a play at their children's school, it's clear Woodruff is one South Carolina town that will continue to be family-friendly in the years ahead.